Whiting 80-ton Drop Table. The quartering machine is currently disassembled and undergoing a complete restoration by our shop forces. Plans are to have it back into operation during 2014. Niles Quartering Machine in pieces on the shop floor. 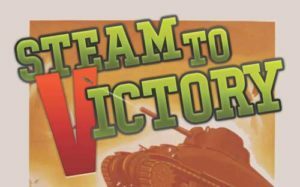 This year has been very successful for the Age of Steam Roundhouse regarding numerous acquisitions for the machine and back shop, as well as for the overall collection. Actually there are too many to list, so we will share just the bigger items with you. Our main focus in 2013 was to fulfill our needs in machinery and tooling, giving this facility better opportunities to be even more self-sufficient in terms of both steam and diesel locomotive repair. 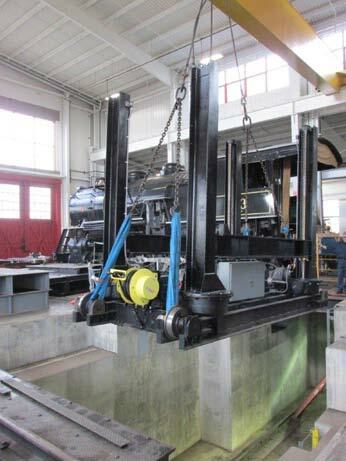 Early this year we started the restoration of our Whiting 80-ton drop table. We are pleased to report that the hard work has paid off—this drop table has been completed and is functioning very well. State of the art electronics have been applied, and the use of wireless technology controls completes the rebuild package. During 1949 this drop table was installed inside the Nickel Plate Road’s Bellevue, Ohio, roundhouse where it served steam and diesel locomotives for the next 30 years. The most interesting shop item that we purchased is the Niles “quartering” machine manufactured in Hamilton, Ohio, around 1946. This particular piece of mechanical craftsmanship was part of a ten-machine order delivered to Poland after World War II as part of America’s reconstruction effort to help war-torn Europe. After many years of use by the Polish Railways this quartering machine was purchased by a gentleman in England for use in his steam locomotive repair shop. After sitting idle for years in the shop’s corner, he decided that this huge machine was not a practical fit for his facility and decided to sell it. Over the years we had made several offers to purchase this machine, and finally reached an agreement early in 2013. Several of our employees made the trip “across the Pond” to disassemble and load it into an ocean-going shipping container bound for the USA. While in England we also took the opportunity to visit the major and a few smaller steam repair shops, as well as several tourist operations. This was a great learning experience for us to see some new repair ideas, as well as to make some new friends and contacts that will be most handy in the future. 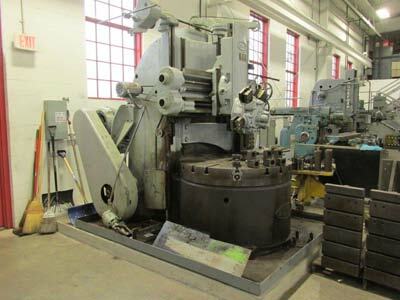 Another 2013 acquisition is the Bullard 54-inch vertical boring mill that we acquired from a surplus sale in New England. This machine was a common sight in railroad repair shops across the US during the days of steam. This machine is undergoing small repairs and will be operational in early 2014. 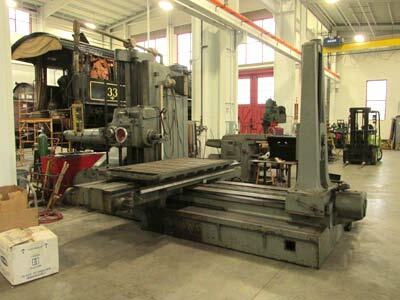 A Lucas horizontal boring mill from a machine shop in Pennsylvania was another purchase made this summer. This mill was recently rebuilt, and we are finishing some upgrades to its electrical system. We plan to have it completed and operational by this winter, as well. Along with these major machine tool purchases, numerous tooling and other components for them have been brought into our machine shop. Steam locomotive work continued in the form of small running repairs and upgrades to our ex-Canadian Pacific 4-6-2 #1293. The #1293 was fired- up a few times during 2013 for several private functions at the Age of Steam Roundhouse facility. 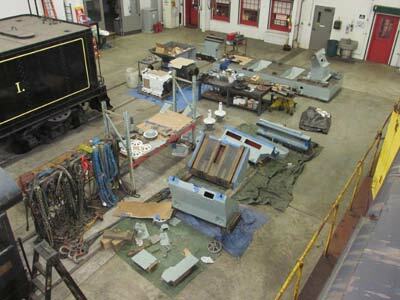 This past fall the Borough of Sewickley, Pa., wanted to dispose of its 1897, Porter-built, 0-4-0T saddle-tank locomotive that had been on display there. It had been used for many years by US Steel in the Pittsburgh area, and, after its retirement, a local gentleman saved it and a Pittsburgh, McKeesport & Youghiogheny wooden, 4-wheel “bobber” caboose. In turn, this equipment was donated to the Pittsburgh History and Landmarks, then to Sewickley. The borough was concerned about potential liability, and wanted the loco and caboose to be given to a responsible organization. Age of Steam Roundhouse was one of six recognized groups that promised to give these relics a good, safe, future environment. 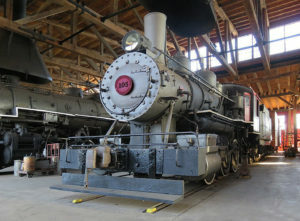 During a city council meeting it was determined that Age of Steam Roundhouse had the best facility for such long-term preservation, and, with a cash donation for the borough’s park, we were awarded ownership of both the locomotive and caboose. One week later on November 21, the 0-4-0T and caboose were moved from Sewickley to Sugarcreek and into the Age of Steam Roundhouse back shop. 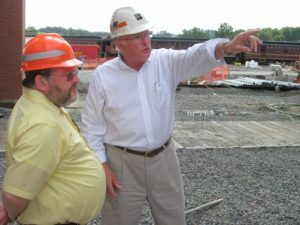 Because of our heavy work load, no immediate plans for restoration have been made. Leviathan on the turntable at the AOSR. appealing as they await their turn to be run through the back shop. Constructed from old blueprints with new materials,Leviathan is a sight to behold, with its copious use of shiny brass, red paint and gold leaf. It will be steamed-up next year and operated to the delight of thousands of railfans. 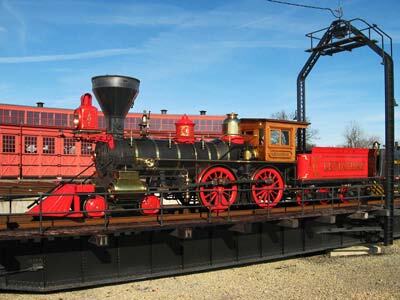 We are happy to share the Age of Steam Roundhouse with this beautiful steam locomotive. Several diesels—both ALCO and EMD products—have seen some repairs, mostly minor. GP7 #1501 received new battery boxes and repairs to its traction motor blower fans. This engine is best known for its use on the Pittsburgh & Lake Erie commuter trains that were operated between Beaver Falls and Pittsburgh into the mid-1980s. The #1501 was also the last P&LE locomotive in operation. lamps have added a nice element to the look (and aroma!) of a steam-era facility. unfortunate that this has become a necessity in today’s society. columns will also be on the agenda for 2014.
personal items. We want to thank them, again, for entrusting us with their treasures. same, yet are much stronger as we move forward into outfitting our facilities with heavy machine tools. locomotives and the Age of Steam Roundhouse facility for future generations to come. they have done— and continue to do— for all of us and our country.